We are in to a new phase with the company where we are starting to visit a few, hand-picket retialers who we’d like to work with to carry Brynje. This, of course means hitting all the major mountain hotspots like Snowdonia and the Lakes. This also means that I get to mix work with pleasure and arrange my day with shop visits followed by a trip up a mountain! I was in Llanberis visiting a great shop, V12 Outdoors, which then allowed me to head up towards Carnedd Dafydd in the afternoon. I planned to tackle Grib Lem spur after reading about it in Trail magazine. 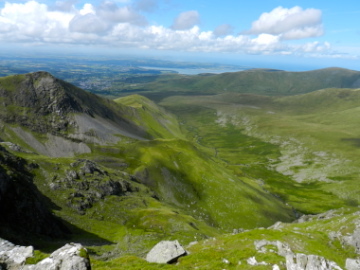 I have been up Carnedd Dafydd before, but not from the Cwm Llafar side….in fact I didn’t know you COULD come up from the Cwm Llafar side until I read the article. So I parked in the rabbit warren that is upper Bethesda, making sure not to park in a spot that would piss off the locals! The sky above Carnedd Dafydd was a thick soup, masking the summit as if to challenge all comers to have a go if they dare. 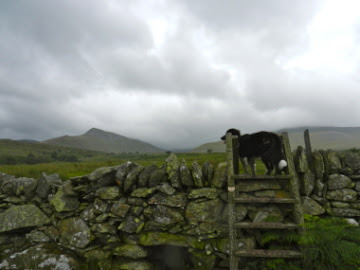 I was confident of the route and my ability to tackle it, the wild card however was my dog. He’s a decent climber, and has done Nantlle ridge, amongst others. He is 9 years old though, and I didn’t really know what lay ahead on the ridge. The Trail article had made it sound tricky in some places, so I figured I’d have to carry the dog……. worst case scenario. The rain was coming down in fits and starts and the air was muggy. All I wanted on was lightweight kit so I went for the Brynje Super Micro C-shirt with my trusty cycling top over it. The brilliant thing about the cycling top is that you can unzip all the way down to vent away all the heat you generate when needed, along with it’s fast drying properties……..and ideal “cap” layer over the Brynje base layer for hot weather. I had a pair of Ex-Officio shorts on (I can’t wear trousers over about 15C….I get too hot), which again are very lightweight, fast drying and super comfortable for scrambling. Their only downside is robustness…so I tend to be careful. I had to faff around for a while trying to find the start of the path! The OS map was not very clear and the track wasn’t marked with anything other than a sign that said “No access for unauthorized vehicles”…nice! Very bloody clear! Anyway, after making my way through some fields, I saw the path and jumped a couple of fences to get to it. It’s then a lovely walk into the mouth of the valley. 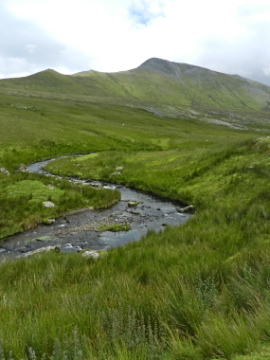 Cwm Llafar is one of those pristine and perfect glacial valleys, symmetrical, steep sides with a meandering mountain river running through it. Again, I failed miserably to capture the beauty and splendor of the place but there you go…..you can’t win them all! You can see the back of the Cwm from a long way back. This is called Ysgolion Duon (Black Ladders), and it’s a daunting and solid cliff face. Because of this, the head of the valley feels very secluded…..helped by the fact that I hadn’t seen a soul since leaving the car! Once back there I had to figure out how to get up onto the spur/ridge. There is nothing marked on the map, and I had inadvertently left the Trail article back in the car. Looking at the map, I figured the steep slope on the Southern side was my best bet. 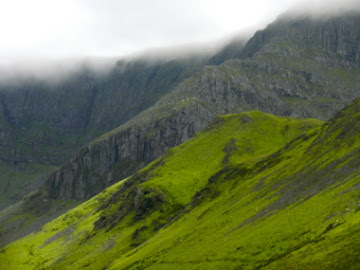 I looked at the Northern approach from Cwnglas bach, but didn’t really fancy it. When I got to the Southern side, Cwmglas Mawr, I was faced with a very steep grass slope to get up to the ridge. With the dog pulling me up, this got to be a tad unnerving as we picked our way up further and further. I had to really pay attention because once I slipped I would pick up momentum instantly and end up in a bloody mess at the bottom……not good. The slope was hard work, but this is where the Brynje Super Micro shirt came into it’s own. I was generating a lot of heat and sweat, so I vented, then zipped back up a few times up the slope. This kept me at a very comfortable temperature and of course felt less wet on my body. The hard work continued until we hit the ridge. Here the challenged changed from negotiating a steep grass slope with a dog on a lead, to scrambling/climbing the jagged and broken rock of the knife ridge. I must say, my dog did amazingly well and although I had to pick the route very carefully and guide him, he climbed everything I asked of him. Once on the ridge, the wind kicked in and I had to throw on my Bergans Helium jacket. It had been sitting in a mesh pocket in my rucksack on and off (where it conveniently fits) and at 320grams is a super jacket to have in the bag. I had taken it out for the odd shower, but in reality that’s not much of a test. There will be more in the next post from the Lake District. The view was fantastic (even though this blog site does it's best to ruin it by re-sampling the picture down and making it look flat.....but anyway! ), and I forgot to mention that the further we got into the day the better the weather was, until we ended up with glorious blue sky with perfect white fluffy clouds. There were indeed a few "spicy" pieces to climb and I had to tie off the dog, figure a way to climb through the jigsaw of rocks, go back, get the dog and thread our way up! I was really enjoying it and when we got to the top I felt it had been an excellent scramble, coming close to my experience at Bristly ridge I thought. We topped out on Carnedd Dafydd and got some superb views of Tryfan, Glyders and beyond. 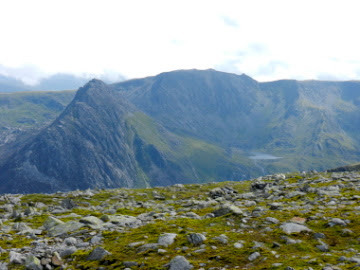 The Shark fin of Tryfan on the left with the Glyders behind....awesome! Once on the top, we met a nice chap called John sheltering from the wind in the stone circle at the summit. John incidentally had also read the article in Trail Magazine and also fancied the route. He came in from the North side, Cwnglas bach, and said it was fine. After a bit of a chat about gear......what else?.....I headed back down Foel Meirch and Mynydd Du and back to he car. A great afternoon and highly recommended route. ......but take a look at the kit that got me there....Brynje Super Micro C-shirt and the Bergands Helium Jacket.